Hello! Hazel and Bell here. 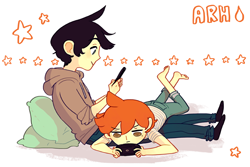 We are the artist and writer team behind the webcomic Always Raining Here. Please note that after February 2018 we will be on Hiatus while working on a new comic. We will be delivering the February rewards but after that it will be a couple months until we update. No one will be charged during this time. Things that will not be delivered in the following months: monthly short stories, sketchposts, postcards and calls. We will post an update before we resume content again. Thanks so much for everyone's understanding while we work on this, and we hope to come back with some things you'll like in the future! We love to make comics, and we also love sharing ARH with everyone. Don't worry, the Always Raining Here comic will remain free! Right now, we're using Patreon as the primary platform to deliver new content, which is currently in the form of light novels (short novels, illustrated with pictures! ), which we found to be a productive way for us to communicate new stories. Currently two light novels are available to read on our patreon: Prison Tower and Decoy + Retrofit. Monthly access to a cozy members-only chat! We're here to answer your questions about creating stories and comics, and chat about anything! You will also get access to Hazel and Bell's monthly newsletter! We will give a brief on what we will be up to that month, along with dates for the monthly livestream that we will be hosting. Online access to a series of ARH short stories that will debut every month! Each short will be at least 1k words in length, and the only way to see them online is through Patreon! Basically you get a monthly dose of Adrian and/or Carter hijinks. You can also look forward to getting previews for other Bell writing work, including concepts and shorts for other future content, like Prison Tower and Decoy & Retrofit! Patrons subscribed at this tier or above who contribute $25+ at any point in their time with us get access to our entire short story archive! Everything in the above tiers: Page updates, livestream, newsletter, access to ARH ongoing Short Stories and other Bell writing work. Access to ARH Sketchposts! Every month we go over four pages in ARH in detail, from the concept stage to the finished product. You get to see how we make the comic, read the original script, and see discarded sketches. Neat! Everything in the above tiers! Short stories, Short story archive, chat access, Sketchposts, everything! One postcard mailed to your address every month, straight from us! New postcard design every month! They contain a new illustration every month, along with a handwritten message from bell and a doodle by Hazel. They are sent out at the beginning of every month following the pay period. Eg. Postcards for March are sent out at the beginning of April). Everything in the above tiers! Short stories, ARH bonus content, chat access, everything! One postcard mailed to your address every month, straight from us! New postcard design every month! Will be sent out at the beginning of the every month. 20 minute skype call with Hazel and Bell every month, where we can give you advice about webcomics, or just have a chat about whatever!